A seven day NHS, and helping people live well with the dementia, will help make UK the most dementia friendly society in the world by 2020. 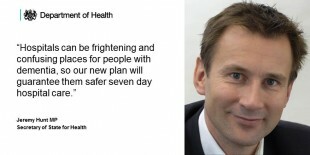 Health Secretary unveils plans to make the UK the most dementia friendly society in the world by 2020. Boosting dementia diagnosis and helping people live well with the condition are key elements of Health Secretary Jeremy Hunt’s plans to make the UK the most dementia friendly society in the world by 2020. For the first time, people with dementia and their families will be able to make meaningful comparisons about the quality of dementia care in their area. The Care Quality Commission will include standards of dementia care in their inspections. Alzheimer’s Society research shows that 92% per cent of people think hospitals are frightening for the person with dementia. The rollout of seven day services will particularly benefit dementia patients as it will help make sure they don’t stay in hospital longer than necessary. If clinically appropriate, all patients, including those with dementia, will be reviewed by a consultant-delivered ward round once a day, every day of the week by 2020 – so there will be better, safer care for patients with dementia in hospital. “A dementia diagnosis can bring fear and heartache, but I want Britain to be the best place in the world to live well with dementia. 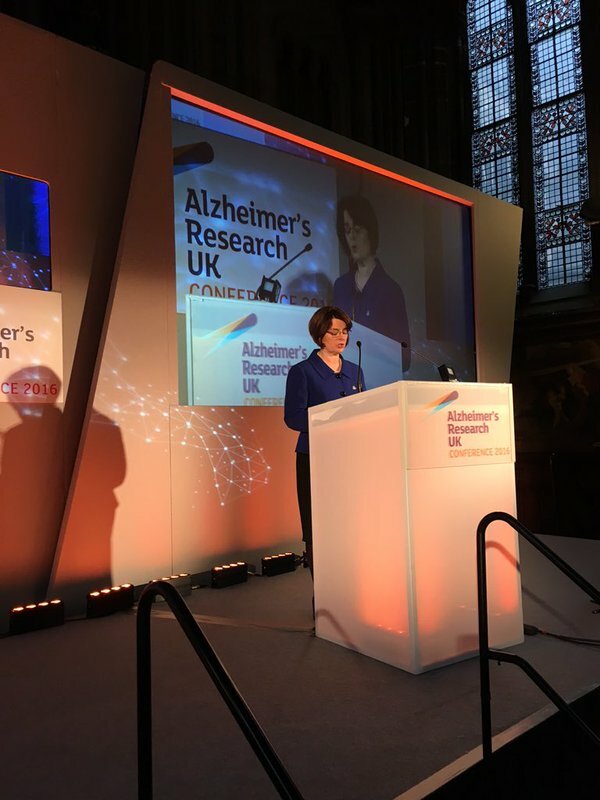 Last Parliament we made massive strides on diagnosis rates and research – the global race is now on to find a cure for dementia and I want the UK to win it. Today’s publications build on a series of national successes on dementia including raising diagnosis rates to their highest ever levels, doubling dementia research funding and getting over one million people to become dementia friends. The Government has doubled research funding and invested £150m to develop a national Dementia Research Institute to drive forward new treatments and help fulfil our goal to find a cure by 2025. This will be supported by our new aim for 10 per cent of all people diagnosed with dementia to take part in research. “We applaud the Government’s firm commitment to make the UK the most dementia friendly place in the world. Until recently, people with dementia were effectively cast out from society, but the tide is now turning. There are now nearly 1.5 million dementia friends helping to drive this change, and communities up and down the country are working to make streets, towns and cities more inclusive. “But still many people with dementia face stigma and a health and care system that simply does not work for them - resulting in emergency hospital admissions, extended stays and desperate loneliness. We look forward to leading the continued transformation of society and investment in research so that, by 2020, people with dementia get the support they need every day of the year – whether that be at home, in residential care, hospital or in the wider community." For the very first time leaders across the health, social care, local government and voluntary sector organisations have signed a joint declaration – committing to improving care and support to people with dementia following diagnosis. Over 1.46 million people have become Dementia Friends. Over 600,000 NHS and social care staff have been trained in better supporting people with dementia. Over 142 communities across England have signed up to be dementia friendly communities. Two thirds of those with dementia now receive a diagnosis of dementia – more than ever before. We invested £50 million in creating dementia friendly environments in hospitals and care homes. The UK Government hosted the first ever G8 summit on Dementia during its presidency in 2014. The Dementia Discovery Fund has been established and backed by worldwide investors. We doubled research funding between 2012 and 2015, to over £60m a year. Record numbers of people participating in dementia research. £150m made available to develop a national Dementia Research Institute.